LinkedIn has recently launched a new Skills Endorsement feature on their website, to compliment their existing Recommendation option. Both are meant to get external validation of an individual’s profile, work history, background, education, and more. While Recommendations are more general and allow for more extensive explanations and interaction, the new Skills Endorsement feature instead focuses on targeting particular skills an individual has. So if you have a particular talent for tax compliance, for example, and a former colleague wants to emphasize or recommend your proficiency in that skill, rather than filling out a long Recommendation, he or she can simply “endorse” your skill. Identify Key Skills on Your Profile: It is important to highlight the key skills you possess in the “Skills & Expertise” section of your profile so people can endorse them. Each skill will be listed separately, with the professionals who have endorsed them pictured to the right (for the top 10). Skills are initially listed in random order but as people endorse them, they are ordered by the number of endorsers, from highest to lowest. Thus, in a graphic way, people who visit your profile will immediately know which skills you are best known for by seeing which skills have the most endorsements. Skill Suggestions: In addition to endorsing existing skills on your profile, this feature also allows for others to suggest relevant skills that they believe you possess that you haven’t mentioned (especially those all important “cross-functional skills” that we always take for granted). This helps to expand your profile and provides a collaborative work space for self-actualization. Enhanced Visibility: The advantage of using the Skills Endorsement feature is that it raises your visibility on the LinkedIn network. Every time you add a skill to your profile, it gets added to your LinkedIn homepage timeline (which others on your network can see). 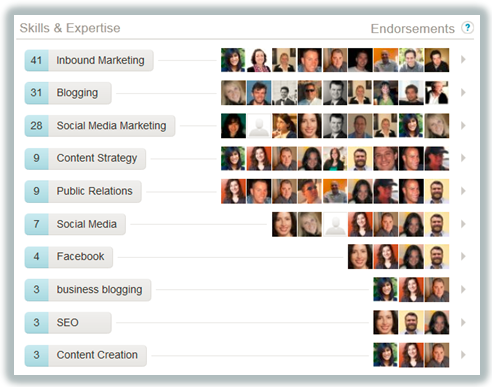 There are also options to endorse skills, like them, or comment about them right on your homepage. Endorse and Get Endorsed: When someone endorses your skills, it gets shown on their activity timeline and your own, thereby increasing the possibility of their contacts and others visiting your profile (which can be very important if you are passively looking for a job). And the same is true when you endorse someone else. So it’s equally useful for networking purposes to endorse other people as it is to be endorsed. Acknowledgement of Endorsement: It is important to thank those who have endorsed your skills. One way of doing so is to use the “Like” button on the LinkedIn timeline. You should also reciprocate and endorse their skills in return. Using the Skills Endorsement feature helps raise the visibility and credibility of your profile on the LinkedIn network and the earlier you start, the more impact it will have. Every individual has a brand that incorporates both their personal and professional image, background, and identity. It is important to cultivate a positive brand amongst your colleagues and your industry, as perception often becomes reality. Branding is done both online and offline. Your online brand consists of your LinkedIn and other social media profiles, membership in online forums, blogs, etc. These are often emphasized today, perhaps overmuch. As people become more concerned about their online image, they tend to ignore the ways in which they must present themselves and their brand when they meet people in person. This offline image, which will be very much in evidence when you attend industry functions or job interviews, must be developed just as much, if not more. Attire: You must dress properly and age appropriately for whatever business or social setting you are in. These days, the boundaries of social, personal, and business are often blurred. However, the simple rule to follow is that your attire should be reflective of your surroundings, the occasion, and most importantly, your image. A wardrobe malfunction is an event that will likely stay with you for a long time, especially when you are noticeable, so dress conservatively. Start a conversation: Make an effort to break the ice rather than standing around waiting for people to come to you. 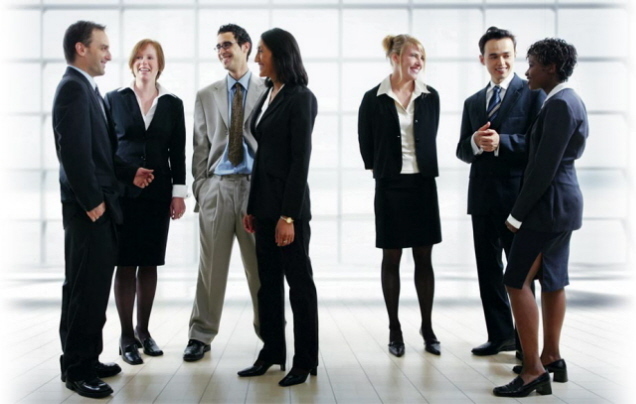 When you meet people, engage them with professional inquiries or discuss industry news at first, focusing on what you might have in common. Keep the conversation going and stay professional until you are comfortable and can exchange more direct and personal anecdotes. Volunteer: This is an important way to give back to your network and open up opportunities to be involved in professional forums and industry bodies to demonstrate your expertise. Volunteer to give lectures, mentor students, host webinars, write columns, etc. for relevant business groups. Extend you value: Make yourself available for discussions outside of business hours. Share your skills with people and illustrate what you can do for them, so they in turn think of what they can do for you. Be consistent (in a good way): What do you want to be known for… being late all the time? It is important to stay confident and focus on maintaining positive characteristics (punctuality, reliability, approachability, etc.). Coaching: Some professionals hire coaches to help them build and sustain their brand. Though it’s not required, a coach can provide useful insights, including strategies to employ and areas you may have overlooked. And they offer a critical eye to point out inconsistencies. Personal image is all about making a positive impression and the best way to make a lasting impression is to wear a big smile, make people feel good, enjoy a healthy sense of humor, and most importantly, say what you mean and mean what you. Offline branding is an art and a skill and to avoid tarnishing your personal brand (since it can be so difficult to redeem), you must take all the necessary precautions to create a positive image and consistently reinforce it throughout your professional career. You are currently browsing the Norwood Consulting Group blog archives for November, 2012.